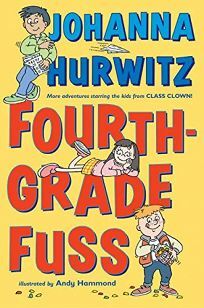 The kids from Class Clown, Fourth-Grade Fuss by Johanna Hurwitz, illus. by Andy Hammond, finds Julio, Cricket and Lucas navigating typical school events, including a statewide standardized test, an ice-skating party and school picture day. .